This is the first on the record confirmation of the pending completion. Acting Attorney General Matt Whitaker said the special counsel investigation is nearing its completion, during a press conference on Monday. It was the first official on-the-record confirmation that the nearly two-year-long probe into Russian meddling in the 2016 election is drawing to a close. “I’ve been fully briefed on the investigation and I look forward to Director Mueller delivering the final report," Whitaker said. Special counsel Robert Mueller and his team of prosecutors have now indicted 34 individuals and three Russian businesses on charges ranging from computer hacking to conspiracy and financial crimes. On Friday, President Donald Trump's longtime friend and veteran political operative Roger Stone was arrested after the special counsel filed a seven-count indictment against him. So far, the indictments have led to seven guilty pleas and three people sentenced to prison. Four former Trump campaign officials -- including his onetime national security adviser Michael Flynn and campaign chairman Paul Manafort are among those who have pleaded guilty. 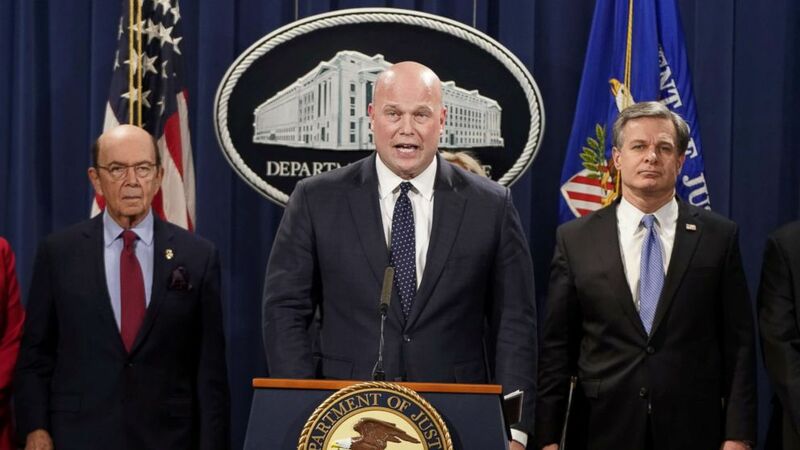 (Joshua Roberts/Reuters) Acting Attorney General Matthew Whitaker, Commerce Secretary Wilbur Ross (L) and FBI Director Christopher Wray hold a news conference to announce indictments against China's Huawei Technologies Co Ltd, several of its subsidiaries and its chief financial officer Meng Wanzhou at the Justice Department in Washington D.C., Jan. 28, 2019. Critics have complained that before taking the job as chief of staff to then-Attorney General Jeff Sessions, Whitaker frequently appeared on television making critical comments about the special counsel investigation, raising questions about his impartiality in overseeing the probe. Whitaker did not recuse himself from overseeing the Mueller investigation after he was tapped to temporarily fill the role left vacant when Trump fired Sessions in November. A Justice Department ethics review determined that recusal would be appropriate, but not required, in his case. Whitaker responded to some of that criticism on Monday saying that the statements he made were when he was "a private citizen only with publicly available information." ABC News Mike Levine and Jack Date contributed to this report.